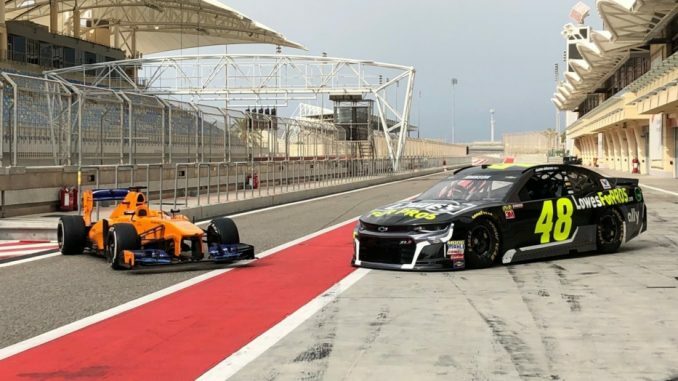 After months of planning the car swap between NASCAR champion Jimmie Johnson and F1 champion Fernando Alonso went off without a hitch in Bahrain Monday. The event took place at the Bahrain International Circuit a day after Alonso ran his final F1 race in Abu Dhabi. The Spaniard is leaving Formula 1 to try other forms of motorsports. Monday’s event featured a Hendrick Motorsports prepared Chevy and a 2013 McLaren MP4-28 F1 car. Although he had not been scheduled to drive the F1 car, Alonso took a few laps around the 5.124 KM track setting a lap time of 1:40.204 second. 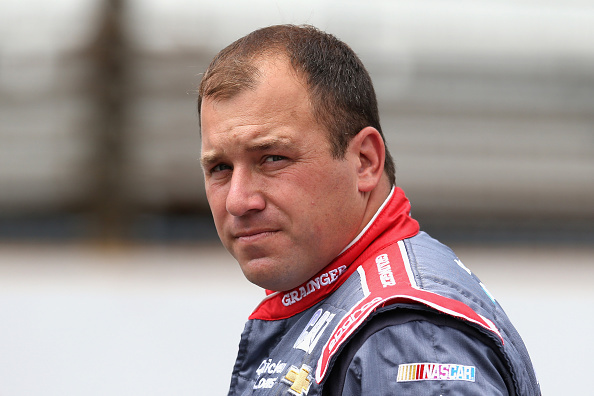 Later Johnson’s best lap was 140.462 seconds, only .2 tenths off Alonso’s time. “Impressive,” Alonso said after Johnson’s run. “I think he was really gaining time every run he was going out. “We came for a full day of testing, I put four sets of tires, I think he put three or four sets of tires, and we were swapping the cars, having fun, but also we wanted to feel the new environment in a representative way and in a speed that we could feel something that it was close to what they feel normally,” he added. For Alonso his laps in the NASCAR stock car were like going back in time. Johnson had never driven a single-seater on a road circuit. “It was mind blowing,” said Johnson who spent the weekend in Abu Dhabi attending the season-ending F1 race with his family. “The sensation of speed…Literally on the first outing, my helmet was trying to leave my head, and I was staring at the microphone in my helmet it was so high! I was like ‘I don’t want to stop but I think I should…’ got my helmet more under control and then it was really my eyes trying to find their way far enough ahead and far enough round the turns. Johnson admitted that while the event was for fun, he is a racer and tried hard to beat Alonso’s time. The event ended with both drivers performing burnouts in their respective cars along the frontstretch.